At AlwaysFreshFish.com we purchase and process only the freshest Bluefish available. Our fish are always caught from the Atlantic Coast of the United States. Bluefish fillets have dark oily meat and a strong flavor; their meat is soft and will flake and break up very easily. It is highly recommended to leave the skin on when cooking. But if you request, we will be happy to remove it for you. Bluefish has long been an East Coast favorite. 1 lb. Fresh Bluefish + 4 lbs. Add. Selections = 5 lb. Total Order OK! 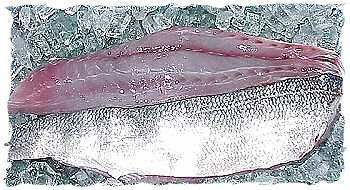 Rinse Bluefish fillets under cold water and let drain. milk. Rinse again with water and place into lemon/butter marinade. Preheat grill, on medium heat. Wraps fillets in foil. For additional information on Fresh Bluefish, please e-mail AlwaysFreshFish.com.